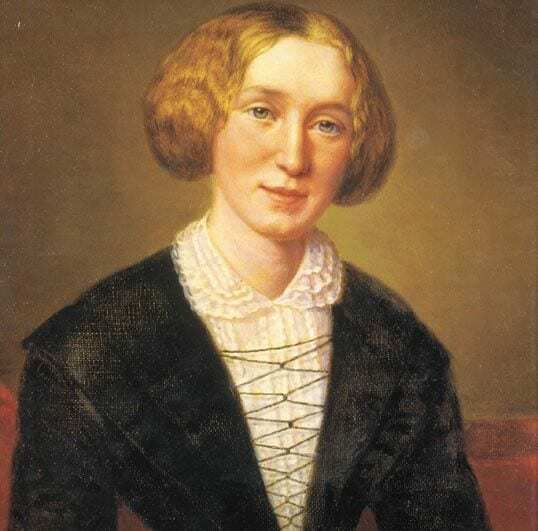 George Eliot was the pen name of Mary Ann Evans, a novelist who produced some of the major classic novels of the Victorian era, including The Mill on the Floss, Adam Bede, Silas Marner, Romola, Felix Holt, Daniel Deronda and her masterpiece, Middlemarch. It is impossible to overestimate the significance of Eliot’s novels in the English culture: they went right to the heart of the small-town politics that made up the fabric of English society. Her novels were essentially political: Middlemarch is set in a small town just as the Reform Bill of 1832 was about to be introduced. She goes right into the minutia of the town’s people’s several concerns, creating numerous immortal characters whose interactions reveal Eliot’s deep insight into human psychology. During the twentieth century there were numerous films and television plays and serials of her novels, placing her in a category with Shakespeare and Dickens. The distinguished literary critic, Harold Bloom, wrote that she was one of the greatest Western writers of all time. George Eliot lived with her father until his death in 1849. He was something of a bully and while in his house she lived a life of conformity, even regularly attending church. She was thirty when he died and it was at that point that her life took off. She travelled in Europe and on her return, with the intention of writing, she was offered the editorship of the journal, The Westminster Review. She met many influential men and began an affair with the married George Lewes. They lived together openly, something that wasn’t done at the time, and, when she became famous after the publication of her first novel, Adam Bede, when she was forty, using the name George Eliot, their domestic arrangements scandalised Victorian society. Lewes’ health failed and after his death she married John Cross, a literary agent twenty years her junior. After Adam Bede more novels followed swiftly on its heels. She died in 1880, aged sixty-one, and is buried in Highgate Cemetery beside George Lewes.